Welcome to Friday Flotsam, an occasional feature serving as an end-of-week blog catch-all. 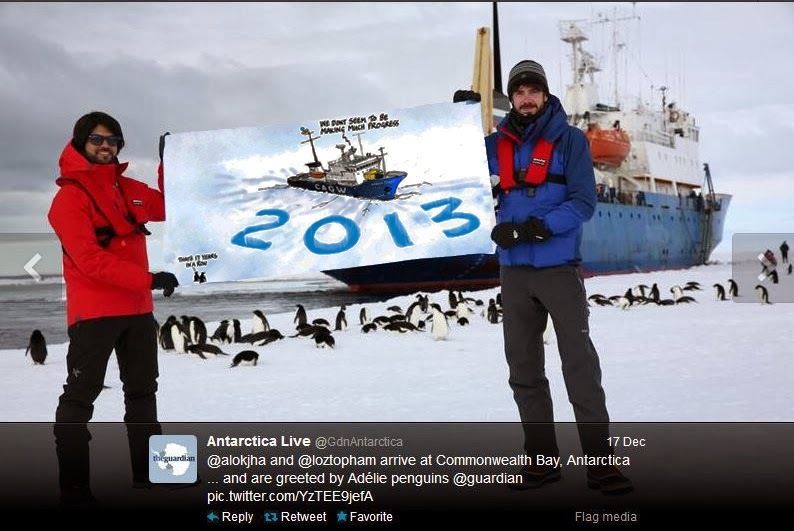 It seems apropos to use this vehicle to collect stories and photos associated with the aborted Australasian Antarctic Expedition (AAE) that captured social and mainstream media attention this week. 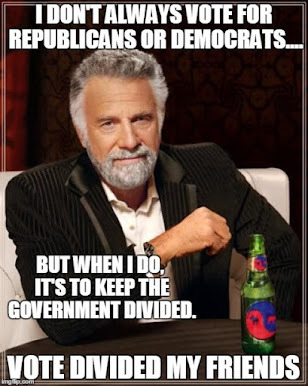 So without further ado, time for the Dividist to stroll down our metaphorical beach ice floe and take note of the detritus that has washed ashore and cluttered this little island ice-locked bay of rationality in the great big frozen blogospheric ocean. "...there is an increasing body of evidence, including by the AAE members, that have identified parts of the East Antarctic which are highly susceptible to melting and collapse from ocean warming...The effects of this marked shift in westerly winds are already being seen today, triggering warm and salty water to be drawn up from the deep ocean, melting large sections of the Antarctic ice sheet with unknown consequences for future sea level rise... We are going south to: 1) gain new insights into the circulation of the Southern Ocean and its impact on the global carbon cycle 2) explore changes in ocean circulation caused by the growth of extensive fast ice and its impact on life in Commonwealth Bay..."
Long story short... they got a bit more Antarctic ice to study than they were bargaining for. 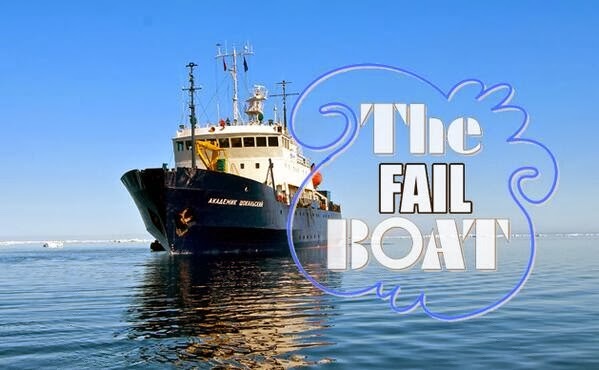 Hence the plight of the Russian ship Akademik Shokalskiy chartered for the expedition. 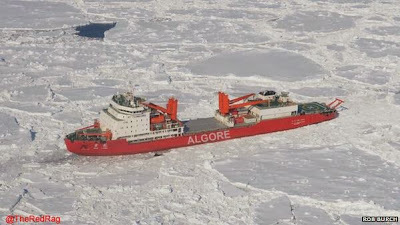 Pictured above, the Shokalskiy is now locked in the "disappearing" Antarctic ice. It has been appropriately renamed/photoshopped by twitterer Ollie Comwell who also rechristened the Chinese icebreaker Xue Long. 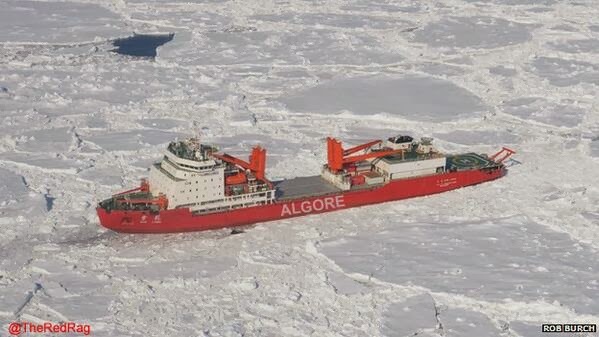 Sent to rescue the ice-locked Shokalskiy, the Xue Long also found itself trapped in the same ice. "December 31 Global Sea Ice Area Was The Largest Ever Recorded"
"Climate experts say that global warming is melting sea ice faster than expected, which is why the poles currently have the most sea ice ever measured for the date." 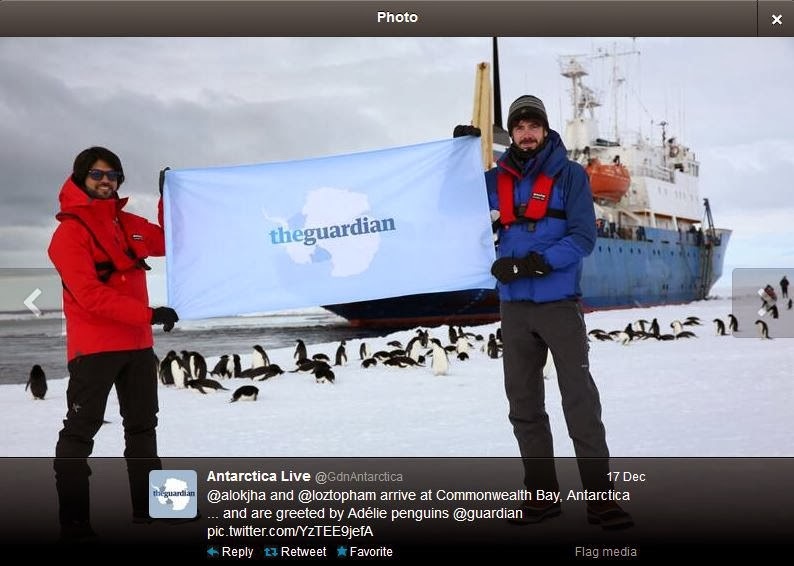 The Guardian is apparently a sponsor of this expedition. The Guardian is also a long-time proponent of the Catastrophic Anthropogenic Global Warming hypothesis and an editorial advocate of public policies based on the assumption that we are all going to die of Climate Change if we don't do something drastic immediately. This expedition is proving to be something of an embarrassment for The Guardian as it is for anyone associated with this truly Epic Fail. The Guardian is now running articles explaining how everyone is misreading the situation and global warming actually causes record amounts of sea ice. Or something. "Five basic Antarctic facts for climate change sceptics"
"Commentators say plight of MV Akademik Shokalskiy shows global warming is exaggerated – the truth is not that simple.... The latest climate report from Intergovernmental Panel on Climate Change, released last year, said there was “high confidence” that the Antarctic ice sheet had been losing ice during the past two decades, mainly from the northern and western parts of the continent, near South America. 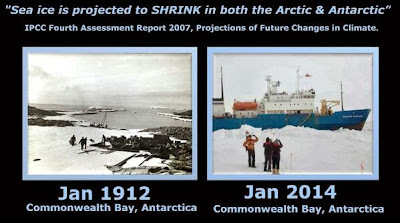 There is high confidence that ice shelves around the Antarctic peninsula continue a long-term trend of retreat and partial collapse that began decades ago,” the report added. But this loss, caused by warming oceans, has been countered by an increase in ice in the Ross Sea region. This is the result of a range of factors, including climate change." "Antarctic sea ice increase is because of weather, not climate"
"Rapid build up of ice that trapped the research vessel Academik Shokalskiy tells us very little about global warming...Some commentators have remarked on what they describe as the 'irony' of researchers studying the impact of a warming planet themselves being impeded by heavy ice. With some even suggesting that the situation is itself evidence that global warming is exaggerated. 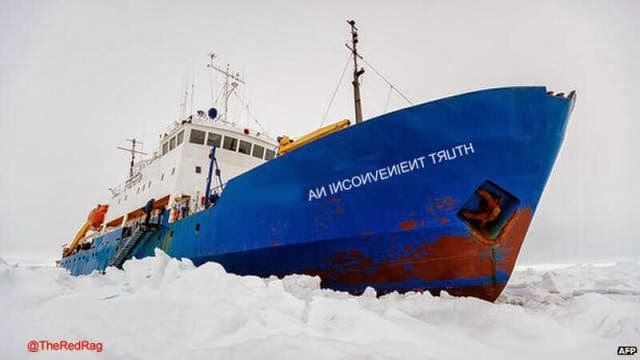 In fact, the local weather patterns that brought about the rapid build up of ice that trapped the Academik Shokalskiy tell us very little about global warming. This is weather, not climate.... What is clear is that the impact of climate change on ice at both poles is complex. In the area where the Akademik Shokalskiy is trapped there has been an increase in sea ice extent for the year as a whole since the late 1970s, although not for the month of December (see attached graph). The amount of ice in the area can vary considerably from year to year making ship operations difficult. The December ice extent in 2011 and 2012 was much larger than the long-term mean, and the ice in 2013 has obviously been of comparable magnitude." Scientists and environment groups say the fall is unprecedented and the clearest signal yet of global warming... Sea ice in the Arctic shrank a dramatic 18% this year on the previous record set in 2007 to a record low of 3.41m sq km, according to the official US monitoring organisation the National Snow and Ice Data Centre in Boulder, Colorado. Scientists and environment groups last night said the fall was unprecedented and the clearest signal yet of climate change...."We can expect more summers like 2012 as the ice cover continues to thin. The loss of summer sea ice has led to unusual warming of the Arctic atmosphere, that in turn impacts weather patterns in the northern hemisphere, that can result in persistent extreme weather such as droughts, heatwaves and flooding," she said... Other leading ice scientists this week predicted the complete collapse of sea ice in the Arctic within four years. "The final collapse ... is now happening and will probably be complete by 2015/16," said Prof Peter Wadhams of Cambridge University... Other groups called on the UK government, and industries across the world to heed the warning signs from the Arctic and act "with urgency and ambition" to tackle climate change." You got that? One more time... 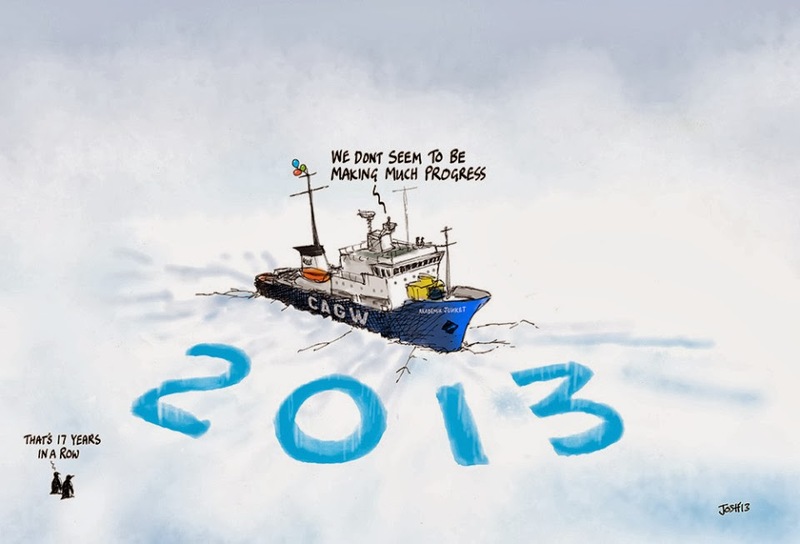 The Guardian explains that both sea ice retreat and expansion are caused by climate change. 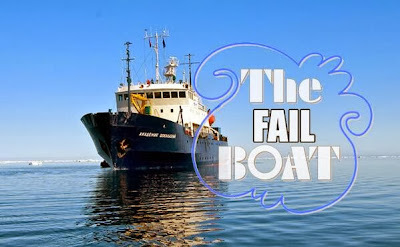 Except for the record sea ice expansion in Antarctica that trapped the AAE expedition which was caused by local weather, unlike the record sea ice retreat in 2012, which was caused by catastrophic global warming. It's obvious when you think about it. Now that the climate change dilettantes are safely off the boat, we're seeing serious blowback in the press, including warmist on warmist friendly fire. Incoming! ... If you follow the discussion around #SpiritOfMawson - the Twitter hashtag for the project - you’ll also note how this misadventure has energized climate change contrarians, offering a distraction from serious research on the impact of climate change on Antarctica... note from Joe McConnell, an American ice-sheet researcher: 'The short and long-term impacts on the Australian science program are pronounced as you can imagine and I understand it is the same for both the Chinese and French programs since their icebreakers were diverted, too. I’ll be sitting down to New Year’s Eve dinner in a few minutes with a number of Australian researchers including the director of the Australian Antarctic Division Tony Fleming – many of these guys can’t complete the research they’ve been planning for years because some or all of their science gear still is on the Aurora." Well. at least Revkin has upgraded AGW skeptics from the pejorative "deniers" to a more accurate "contrarians". That's progress I guess. UPDATE: AAE leader Chris Tunney begs to differ about the scientific value of his expedition and proceeds to violate the first rule of holes. When you are in one, stop digging. ITEM - The Science Abides. 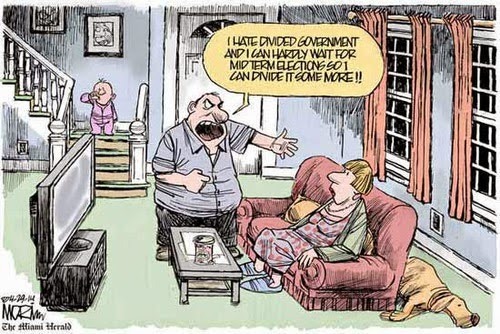 The simple reality is this: The Guardian is right ( um.. To be perfectly clear... I mean they are right in the 2nd of the 3 mutually contradictory articles excerpted above) and Professor Chris Tunney is partially right. The Shokalskiy was trapped in ice by local weather conditions. Nothing can be concluded about climate change or global warming by this event. Just like the deep freeze gripping North American this weekend, or Hurricane Sandy, or the heat wave two years ago, or midwest tornado clusters, or drought in California, or Colorado flash floods, or arctic sea ice shrinking in 2012. All are weather, not climate. The extent of climate change/global warming/global cooling can only be determined by careful, detailed statistical analysis of quality repeatable data measured over decades. The computer models that prompted the Catastrophic Anthropogenic Global Warming panic of the early 2000's and was the basis of Al Gore's proselytizing documentary "Inconvenient Truth" have failed. 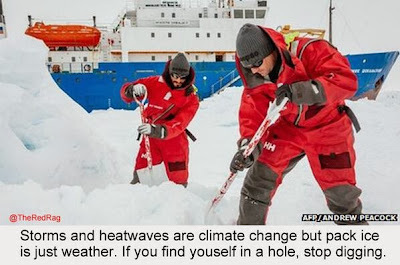 They do not and have not accurately predict measured global temperature trends over the the last 17 years despite the increase in atmospheric CO2. The science of Catastrophic Anthropogenic Global Warming is not settled. Not even close. If the climate dilettantes of the AAE "Spirit of Mawson" psuedo-scientific expedition helped to make that one fact clear, they have done us all a great service. It never gets old. All we need now is the Taiwan Animation treatment. *Note: I don't know the source of this poster/meme at the top of this post. Will credit if I find it. However, I do know the women in the photo were not part of the AAE Expedition. I just thought the poster funny. And appropriate. And Funny. 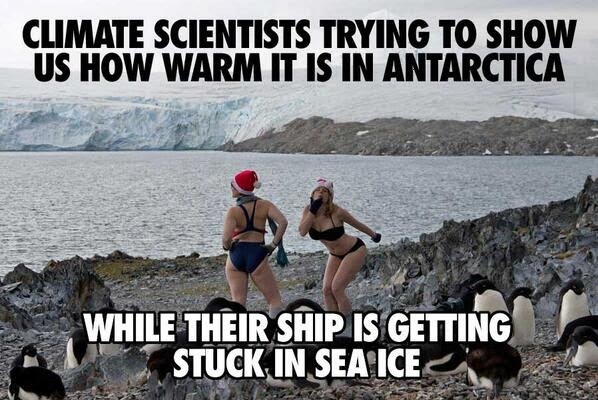 Just to tighten the absurdity screws a bit, some of the rescued consciousness-raising eco-tourists are complaining that their return to "civilization" is being somewhat delayed so their Aussie rescue ship can finish the supply delivery to a real Antarctic research station that was interrupted by having to go get their butts off of the Russian ship. I think the trip organizers should get the bill for the rescue. The whole thing. "some of the rescued consciousness-raising eco-tourists are complaining that their return to "civilization" is being somewhat delayed so their Aussie rescue ship can finish the supply delivery to a real Antarctic research station"
In this case, I agree with them. There is no possible way to overstate the value of their "consciousness raising" on the general population.